Recently our developers Adam and Paul have been very busy adding new features to CiteAb.com – one of which is our exciting Enhanced Profile option. 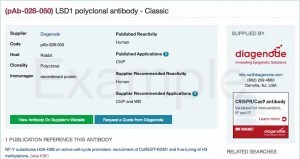 An Enhanced Profile gives antibody suppliers a chance to add premium features to each of their CiteAb antibody pages. This includes their company logo, contact details, an advert and a “get a quote button”. Our founder Dr Andrew Chalmers said: “We are aware that in addition to being reassured by citations that prove a particular antibody works, CiteAb users want to know about the companies they are buying antibodies from. “We regularly run company profiles on our blog that aim to let researchers know about the values and specialisms of different suppliers, and the new Enhanced Profile feature builds on this. “The Enhanced Profile option offers companies a unique way to promote their brand and provide a consistent message as users transit from CiteAb to the company’s website, giving them an opportunity to add some of their personality. The new feature gives companies the opportunity to advertise or cross-sell in an advertorial slot, or to use the space to indicate a guarantee or service promise. You can see example of some of our first companies to make use of our Enhanced Profile option live on CiteAb.com. For example, Diganode recently launched a new CAS9 antibody, the first of its kind on the market. They used their enhanced profile to boost visibility of this new product. Biolegend use the space to promote a particular product range, and Novus have gone for more general brand awareness. If you’re an antibody supplier interested in our new Enhanced Profile option then simply contact Matt by email. If you’re a researcher who is interested in a particular supplier, do search our blog to see whether we’ve interviewed them recently, or let us know in the comments below and we’ll try to interview them very soon! Some recent company highlights you might enjoy!